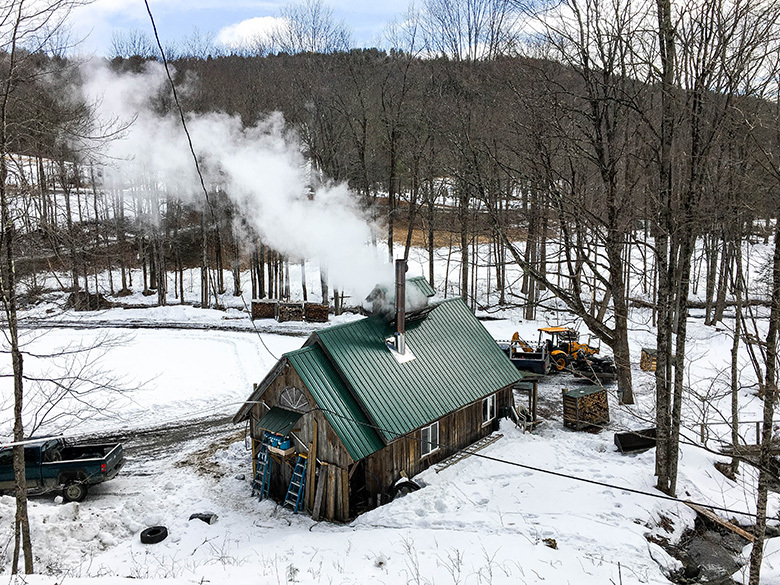 Disclosure: I recently had the opportunity to take a behind the scenes look at the New England maple syrup industry with Arnold Coombs (a seventh generation maple syrup guru!) and Coombs Family Farms. 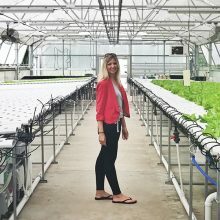 In today’s blog post, I’m sharing a little bit about what I learned on this trip, as well as a new (and easy!) 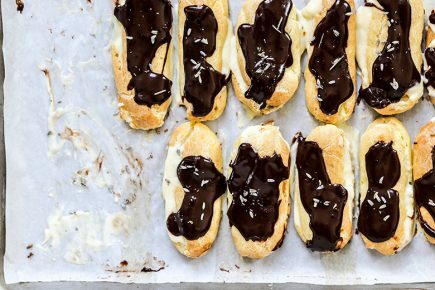 recipe that features pure New England maple syrup. I hope you enjoy it! New England is well-known for many foods. Lobster, clam chowder, baked beans, fluffernutters and apple cider donuts all quickly come to mind. But my most beloved New England staple has got to be maple syrup. I’m a maple syrup junkie. As a kid, I would tediously fill EVERY divot in my waffles with the sweet, thick elixir. 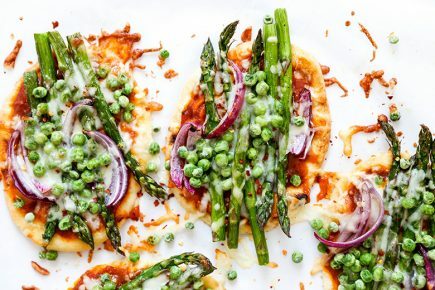 And now as an “adult”, I use maple syrup in everything from baked goods, side dishes, cocktails and condiments. It’s my liquid sweetener of choice. And I have been known to affectionately refer to it as “liquid gold” on more than one occasion. Maple season is happening right now here in New England. 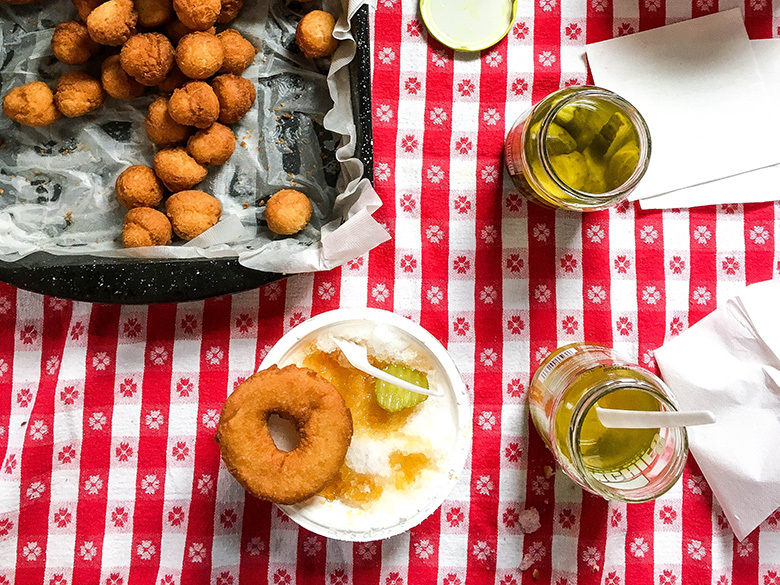 And a popular activity for both tourists and locals alike is to go and visit one of the many “sugar shacks” that are scattered across the New England country side. 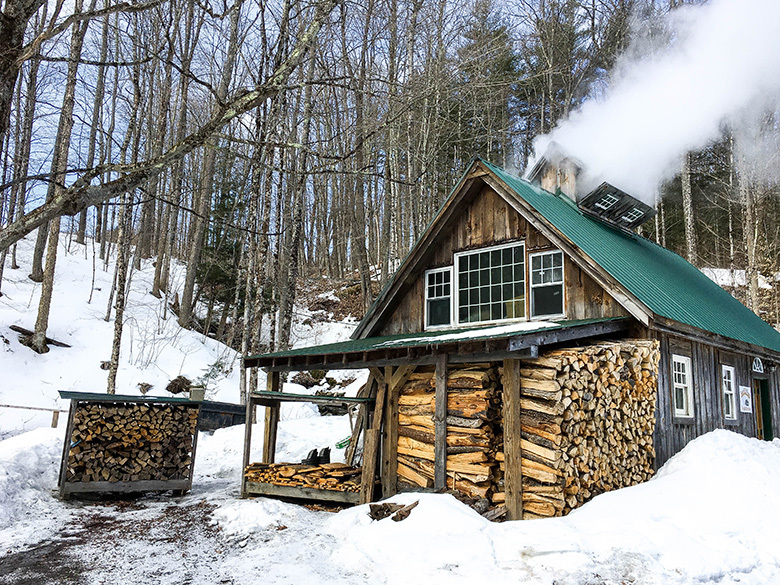 At these idyllic places, you can get a behind the scenes look at how maple syrup is made. And of course, you can taste the product. Because quality control is important, people! Maple sap comes from maple trees that are a minimum of 35 years old (although they can live to up 300 years!) and 12-inches in diameter. The trees are “tapped” in the early Spring, when temperatures are still below freezing at night but reach above freezing during the day. This fluctuation in temperature is what converts the starch in the maple trees into sugar. And it also promotes “flow”. When the sap comes out of the maple trees, it’s thin, mostly clear and contains only about 2% sugar. It looks a lot like water. And it’s barely sweet. It needs to be reduced by approximately 40-fold before it’s ready to be packaged and sold as maple syrup. Yes, you read that right. You need 40 gallons of maple sap to create 1 gallon of maple syrup. The term “liquid gold” makes more sense now, doesn’t it? 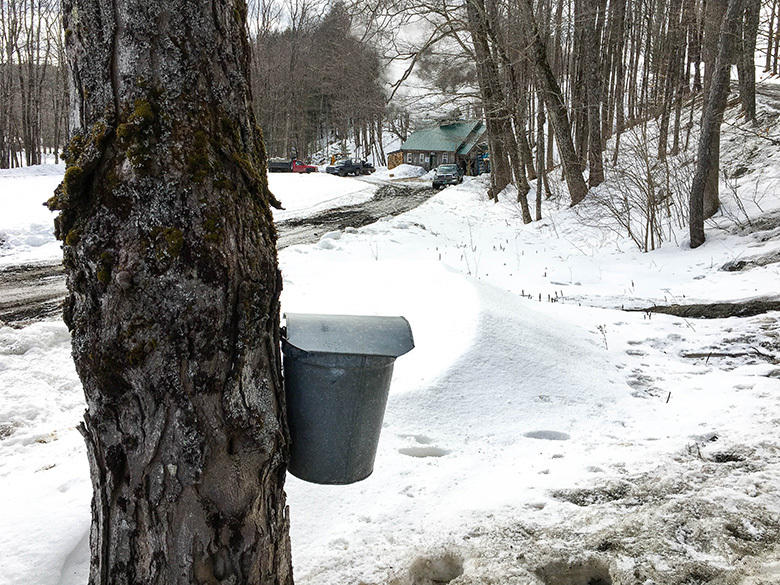 Smaller, more traditional sugar shacks may still use buckets to collect sap. And wood fired evaporators ( = basically like a giant wood stove) to boil and concentrate the sap into maple syrup. Larger farms and production facilities have networks of pipelines and vacuum pumps to collect and transport the sap from the trees into storage tanks. And they often employ reverse osmosis as an additional technique to remove water before they begin the boiling process. But other than boiling and some filtration (the stuff does come from the woods, after all! ), there isn’t a whole lot of additional “doctoring up” that needs to be done to covert maple sap into maple syrup. Pure maple syrup is exactly that: pure. And that’s what makes it so darn special. And so irresistibly good. After my trip, I was thinking of ways to incorporate maple syrup into some new recipes for Easter and/or Mother’s Day. 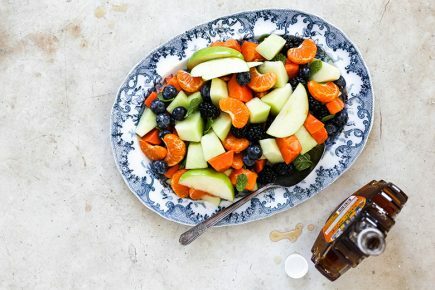 And I immediately thought of making a maple syrup-sweetened “intentional” fruit salad. So what the heck do I mean by “intentional” fruit salad? Well, I mean that we’re not just tossing whatever is left in our refrigerators into a big bowl and calling it a fruit salad. We’re being thoughtful about the ingredients we choose. And we’ve even got a formula to follow. It’s science! OK. Maybe it’s not science. But there is a formula that I’ve laid out. 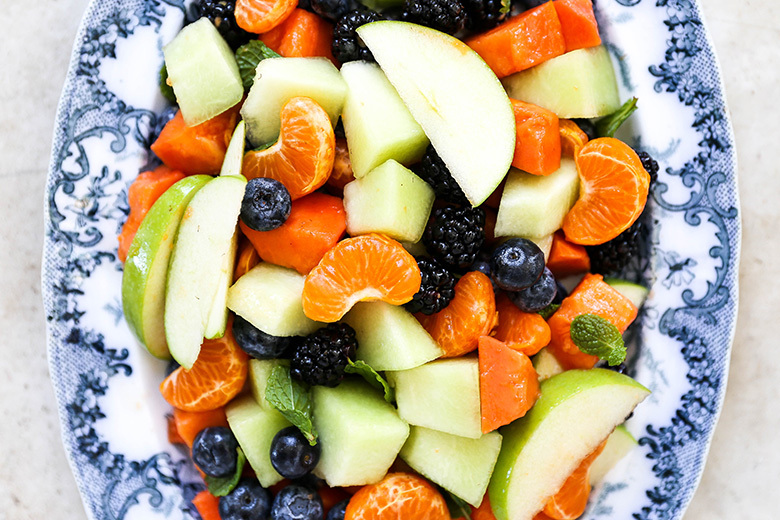 And I hope you can use it as a helpful guide for building some epically delicious and balanced (colors, flavors and textures are all part of the equation) fruit salads that are worthy of being serve at your next gathering. Since I can’t possibly list out all the potential ingredients for each category (and account for seasonal variations, too! ), feel free to branch out from the suggestions I’ve given. Nothing is written in stone here. As I said, this is simply a guide for you to use for inspiration if/when you may want/need it. BUT. 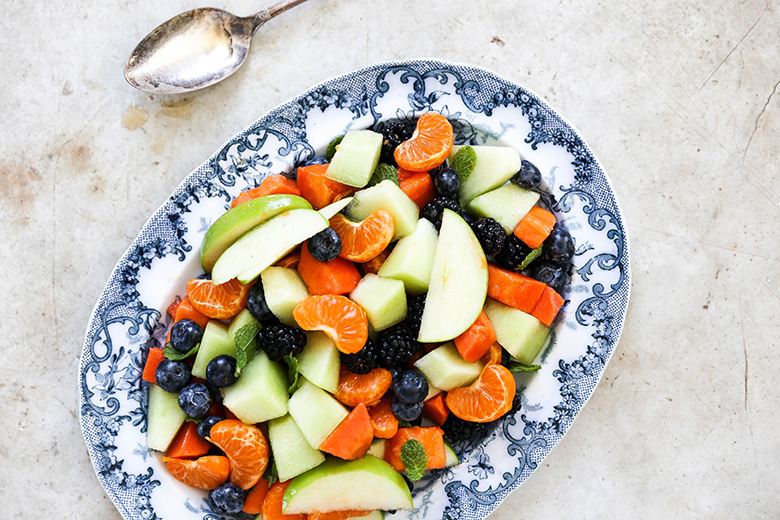 The fruit salad shown in these photographs is definitely a keeper. And I thought that you might want to make it “as is”. 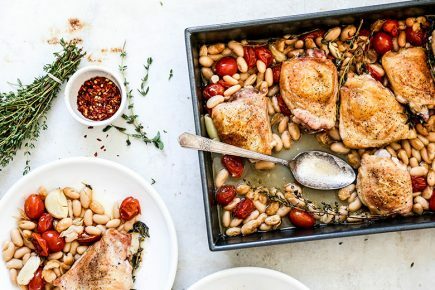 So I’ve provided the exact recipe below. I hope you give it a try. 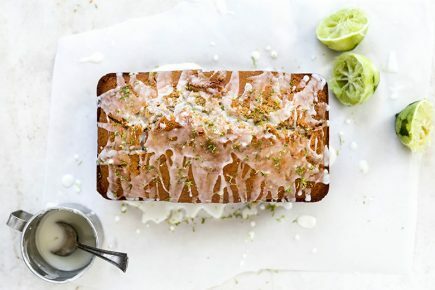 Or at least use it as a jumping off point to play around with some other ingredients. 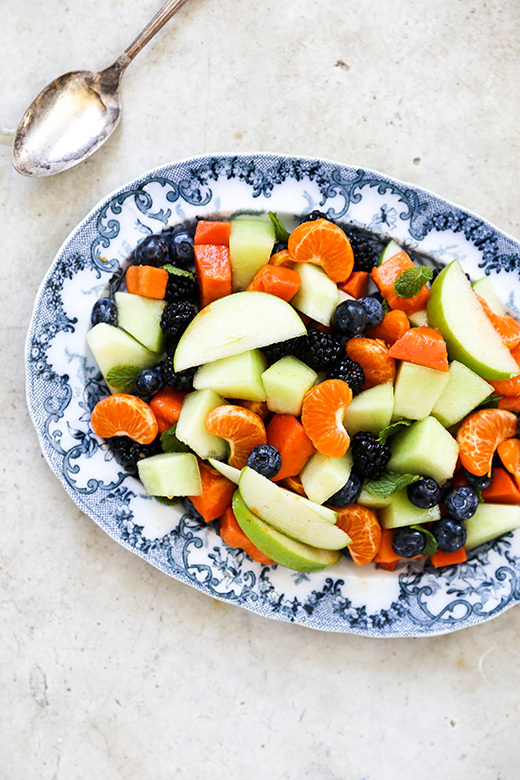 You really can’t make a mistake when it comes to fruit salad. Well, except for over mixing and over dressing your fruit salad. Those are both no-no’s. Use a light touch when possible! 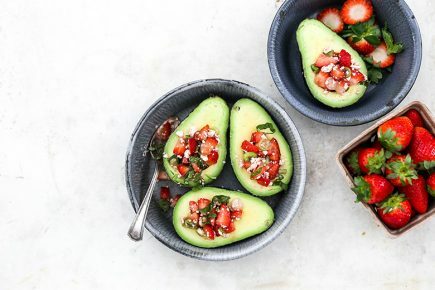 Add all the fruit and the mint to a large bowl or container. Set aside. In a small bowl, stir together the maple syrup, vinegar and salt. Pour this over the fruit, tossing gently to combine. Serve immediately. Or store in your refrigerator (up to 1 day) until you’re ready to serve it. Liquid gold indeed! But I love how pure, yet concentrated it is. I didn’t know the maple looks like water as it’s extracted from the trees. My hat’s off to the first discovery of maple. It is truly special. I’d love to visit someday to see this process unfold. I’ll put it on my list! 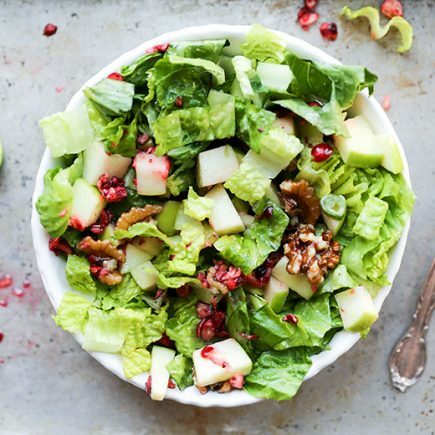 This salad looks so fantastic, Liz and completely approachable. I am absolutely looking forward to fresh berries and all the summer goodness the season brings. I know what you mean about the first discovery of maple. Like, how did they know it would be so good. Especially when it just looks like water!?!? I hope you get to a sugar shack someday. You’d love it!